This entry was posted on May 20, 2015 at 11:59 am and is filed under Drama. You can follow any responses to this entry through the RSS 2.0 feed. You can leave a response, or trackback from your own site. I mostly review new films, but I always enjoy returning to a classic. Yes I’ve read the book as well. I second the recommendation of the book. I read it either right before or right after I first saw the movie a few years ago and it was just too powerful. I love the machine imagery. The inner mind of Chief was priceless. This is one of my favourite ever Oscar best picture winners and the book is even better! The book is very good, yes. I tread it in high school actually. Great review of a great movie! Very complmentary (and justifiably so), of Nicholson and Fletcher for their performances, but I especially thought the bouquets you threw to the supporting cast worthy of note. The cast goes far in explaining the long term classic status of this great film. Those patients are so tragic. Some in performances where they don’t even speak. My heart goes out to them. P.S. I know it’s just a movie, but that’s how powerful this was. Remember their first confrontation over the volume of the music? Nurse Ratched: “What you probably don’t realize is that we have a lot of old men in this ward who couldn’t hear the music if we turned it lower. That music is all they have. The calm manner in which Nurse Ratched delivers this response is pure brilliance. Great review. I love this movie. I’ve seen it twice so far and I want to see it a few times more. Jack Nicholson’s performance in this movie is incredible, and those last few scenes kill me. I’ve seen it several times of the years and it just gets better with each viewing. Great review. This is actually one of the examples where a film is as good as the book. Mark you say according to your moods you have 5 all time favourite movies. One is The Godfather, then One Flew Over The Cuckoo’s Nest and The Shawshank Redemption. Which are the other two ? That’s such a great question that I don’t have a definitive answer to. LOL The Fifth Element and The Wizard of Oz are the others. While The Godfather is a classic that I enjoy immensely, I’ve never given that as my favorite film. I don’t have a rock solid relationship with The Godfather, nor do I have one with Wizard Of Oz and The Fifth Element, but Shawshank is a whole different experience. 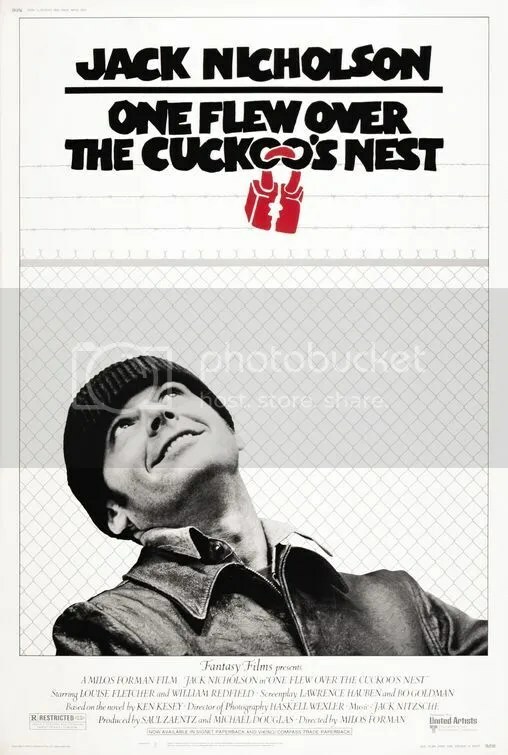 I would have watched One Flew Over The Cuckoo’s Nest if I wouldn’t have been reading the novel right now. Once I finish it, I will definitely watch it. Mark, your love for foreign movies is apparent due to your numerous reviews of them. I wanted to ask if you have watched any Indian movies. And thank you for placing Perks of Being A Wallflower on top of your 2012 top 10 list. I would have never have had the courage to watch because of the immense emotional attachment I have with the book. I’ve seen Salaam Bombay!, Lagaan and Monsoon Wedding. There may be others. You should really watch Taare Zameen Par, 3 Idiots and Drishyam. They are superb. I have watched Lagaan of this three. What a great movie that was ! I knew One Flew Over the Cuckoo’s Nest was a classic, but I didn’t realize it did a clean sweep of the top 5 categories at the Academy Awards that year. Wow. As a character Nurse Ratched clearly made an impact on popular culture, because any caretakers who are tough on their patients are jokingly refered to in daily life as Nurse Ratched. Her name has become synonymous with an overbearing amd cruel perfectionist.